Two weeks ago, we discussed how a range of newly emerging, interconnected digital technologies (such as artificial intelligence, big data and the Internet of Things, among others) are predicted to profoundly change business and society. We explored how new technologies pass through different phases of the hype cycle before eventually producing meaningful, marketable applications. In Part 2 of this three episode article, let’s next discuss what challenges digital transformation places on both established and new businesses, and then explore what strategies established firms may employ to successfully master digital transformation. What challenges does digital transformation pose on established businesses and start-ups? Christensen distinguishes innovations into two types — sustainable and disruptive ones. Sustainable innovations focus on new ways to grow existing technologies by enhancing their performance, typically through extended functionality or increased capacity. On the other hand, disruptive innovations solve a challenge in an entirely new way or for an entirely new group of people, thus changing the landscape of a whole industry or even sparking a new one altogether. Christensen also introduces a new theoretical framework, the Resources, Processes, Values Model. 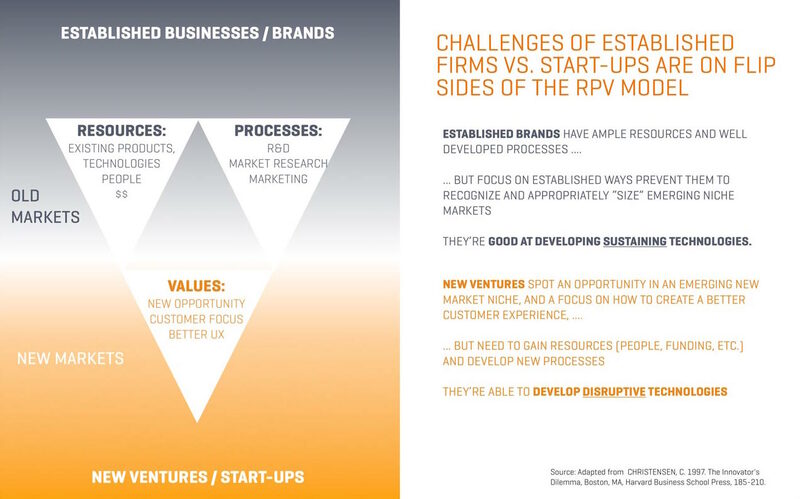 The RPV model captures how established organizations differ from start-ups in the ways they utilize resources (things and assets which firms can buy, sell, create or destroy), processes (established ways to transform resources into products or services) and values (prioritization criteria for making decisions). Established firms have plentiful resources and well-honed processes, but tend to be too internally-focused, bureaucratic and set in their values. In contrast, start-up ventures are strongly market- and customer-focused, thus allowing them to recognize new business opportunities early while —at least initially— having to deal with scarce resources and less efficient processes. Christensen highlights that established firms excel at creating sustainable innovations that build on or extend established product and services categories. However, they tend to fall short on coming up with disruptive innovations for three reasons: (1) They heavily invested into the development of resources (their legacy products, services, technologies and systems), and tend to escalate their earlier financial commitments. Moreover, developing new “risky” products and service areas (question mark) may also cannibalize sales of their current stars and cash cows. (2) They are loyal to their established ways of doing things and highly efficient processes. (3) They tend to undervalue the impact and future revenue potential of emerging new technologies and business opportunities at the fringes of their industry. Christensen highlights that established firms excel at creating sustainable innovations that build on or extend established product and services categories. However, they tend to fall short on coming up with disruptive innovations for three reasons: (1) They heavily invested into the development of resources (their legacy products, services, technologies and systems), and tend to escalate their earlier financial commitments. Moreover, developing new “risky” products and service areas (question mark) may also cannibalize sales of their current stars and cash cows. (2) They are loyal to their established ways of doing things and highly efficient processes. (3) They tend to undervalue the impact and future revenue potential of emerging new technologies and business opportunities at the fringes of their industry. On the other side, most start-up ventures focus on —and excel at— producing disruptive innovations. This is because they not only recognize emerging new technologies and business opportunities (which some incumbents do, too), but also use a trial and error approach to uncover promising niches (with regards to customers and/or product applications) and then offer an adequate or even better product at a lower price. The “innovator’s dilemma” describes the situation when an incumbent that originally pioneered or dominated the market would have to cannibalize its own business to successfully compete with a new, disruptive competitor. What has all of this to do with digital transformation? Most digital technologies are disruptive in nature, meaning they are simpler, more convenient, more reliable and cheaper than established technologies. In established firms, commitment to their legacy resources, processes and values makes it unlikely that they can internally rise to the challenges (threats and opportunities) posed by digital transformation and its disruptive innovations. In contrast, start-up ventures have the right values to drive digital transformation and, provided they smartly use and gradually grow their limited resources base and creatively approach the process side of their business. What are strategies for established firms to master digital transformation? Acquire external digital know-how (fully or partially). An established corporation can easily add digital products and expertise to its business by acquiring a successful venture with a digital technology or application in a niche that is relevant to its industry. For example, in 2016, the multinational toymaker Mattel acquired the San Francisco-based baby health wearable maker Sproutling. Alternatively to a full takeover, an established firm may also acquire stakes in promising digital start-up ventures to participate in their developments. For example, in March 2018, Allianz and Tencent announced investing $160 million for an undisclosed stake in the German mobile phone banking start-up N26. Spin-out digital initiatives into a new venture. 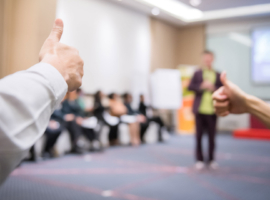 Suppose you’re an established firm pursuing internal R&D initiatives and come up with a worthwhile development project that doesn’t fit to your processes. In this case, Clayton Christensen recommends to spinout the initiative into a separate venture; and to commit some of your most qualified managers and developers to lead it. The spin-out can be run like a lean start-up and may even seek additional external funding from other investors. Spin-out strategies have been not uncommon in certain industries (such as pharmaceuticals or biotechnology) as well as at tech-driven universities. Moreover, digital tech ventures also use it to better market promising new applications that they added later to their initial core offering. For example, in 2014, Fog Creek Software spun out its web-based project management application Trello into a separate company. Going forward, such spin-outs promise to also become a feasible strategy to commercialize new digital projects emerging in mature established corporations. Run focused innovation projects, then use “scrum” teams for implementation. Another strategy to gradually add more digital products and services to your established firm is to run a series of focused innovation projects targeting digital value creation. Thereby, one or more project teams go through an innovation project (ideally facilitated by a professional innovation firm such as Thinkergy using a sophisticated and effective innovation process method like X-IDEA) to come up with a series of meaningful digital concepts. Then, build scrum teams to quickly implement the top concepts. Each scrum team consists of a number of skilled developers coordinated by a scrum master (with extensive technical expertise) and is led by a project owner (with business expertise), both of who coordinate with the internal project sponsor and other stakeholders inside and outside the organization. Transform into a creative company. The most challenging —but in the long run also most promising— strategy is to transform the culture of an established corporation into a creative organization. Gradually building up an innovation-friendly firm requires takes at least three years of gradual change steps and requires the dedicated commitment of the top executive team (see how we suggest executing such a CooL change). For example, in 2005, Jeffrey Immelt successfully launched a creative change initiative based on an “Ecoimagination” theme to transform General Electrics from a sales-driven to an innovation-focused organization. Identify the right people for your digital transformation. Making your business more digital requires you to take action on the people side, too. On the one hand, companies should heavily involve their “digital natives” (i.e., younger staff belonging to Gen Y and Gen Z) in digital project initiatives. On the other hand, innovation-centered cognitive profiling tools such as Thinkergy’s TIPS can help companies to identify those profiles who have a natural talent and passion for driving digital change into the organization. Interim summary and outlook: Established corporations and start-ups face opposite challenges from digitalization: The former have ample resources and sound processes while lacking entrepreneurial values that allow them to recognize digital opportunities, while the opposite is true for start-up ventures. Established firms may use at least five strategies to better master digital transformation. But what are game plans for start-ups to seize their ability to recognize worthy digital opportunities in spite of scarcer resources and less refined processes? Find out in two weeks in the third and final episode of this article on digital transformation.